Norton Fredrick, the former Ceylon fast bowler must be the only cricketer in the country and possibly in the world to have a road named after him. He lives at Norton Place in Enderamulla, Wattala. The road was named after him ten years ago by the people of the area in recognition of the social service he and his wife Nalini did for them. Fredrick is the chartered president of the Lions Club of Enderamulla. At 72 years Fredrick is quite fit and healthy and still goes to work daily. He handles administration and human resources at an ISO building company KSJ Construction run by his friend Sarath Jayabahu. Although stockily built for a fast bowler, Fredrick had all the ingredients that go to make a fast bowler – a short temper and the speed to cause grievous injury to batsmen although that thought was furthest from his mind. Fredrick’s four-year career withCeylonwas short, but he made a big impact in those few years as a new-ball bowler. Although not the orthodox type, Fredrick generated a great deal of pace, his most potent delivery being the inswinger bowled with a high arm action with which he beat batsmen regularly and bowled them through the gate often hitting the bails. He wasSri Lanka’s version of ‘Fiery Fred’ the name given to formerEnglandfast bowler Fred Trueman. Fredrick’s most memorable match was the unofficial Test against India played at Ahmedabad in 1965 where he creamed the top order of the strong Indian batting line-up in both innings to set up a historic four-wicket win for his country. That victory till today remains the only ‘Test’ win for Sri Lanka on Indian soil. Fredrick took seven wickets in the match (4/85 off 28 overs and 3/24 off 11 overs) and amongst his victims was opening bat Dilip Sardesai (twice), Indian captain the Nawab of Pataudi (twice), Farokh Engineer, Abbas Ali Baig and Hanumant Singh, who according to Fredrick was the best batsman inIndia at the time.India was put out for totals of 189 and 66. It was when Fredrick joined the Prisons Department as a welfare officer that his cricket career really started to take shape. WAN Silva the formerSri Lankacoach who was two years senior to Fredrick encouraged him to joinBloomfieldin 1959 and in the first match he played he took five wickets and never looked back since. He played eight years of Sara trophy division I cricket forBloomfieldhelping them win the title in 1963-64 under Noel Perera by taking 57 wickets. In his entire career forBloomfieldhe captured 183 wickets (avg. 16.58). The four years he represented his country (1964-1968) againstAustralia, MCC,IndiaandPakistan, Fredrick opened bowling with Darrel Lieversz and then with Ian Pieris and played under the leadership of CI Gunasekara and Michael Tissera. 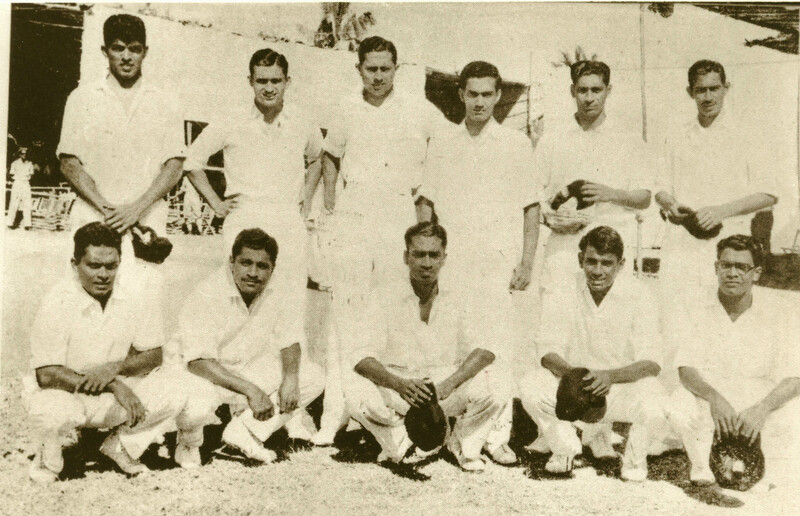 Fredrick played cricket for CTB for 20 years and captained their veteran’s team. He was also vice-president of the National Services Cricket Association. He became the first chairman of the WesternProvincetransport authority before joining East West as general manager. He was among the first lot of match referees appointed by Sri Lanka Cricket in 2000 to officiate in domestic matches. He did it for about eight years before quitting because of unfair treatment he and some others received when they were sidelined from important assignments. 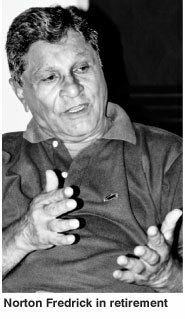 He returned briefly to perform public announcements at international matches for SLC, but was critical of the interim committee chairman DS de Silva for putting a stop to a five-year talent search programme (begun by Aravinda de Silva) where he along with another former Ceylon cricketer Muttiah Devaraj had begun unearthing some exiting talent like Angelo Mathews, Lahiru Thirimanne, Chatura Peiris and Ramith Rambukwella. “I have my reservations about DS de Silva. He played cricket with me during my time and whenever he sees me he shows his thigh where all the seam marks are there where I had hit him. I am very hurt that DS has refused to look at us. Once they get to a higher position they completely forget others and only look after themselves,” said Fredrick. “DS should have looked after the past cricketers. There are about 15-20 of us who are given a paltry pension by the Cricketers’ Association of about Rs. 10,000 a month. Many of the past cricketers today are in dire straits. I have told the Cricketers Association to hand over the pension scheme to Sri Lanka Cricket because they have the money, but it has never happened. It is the moral duty on the part of the Sri Lanka Cricket to look after the past cricketers. There were some people who were not cricketers who headed interim committees in the past; they at least looked after us better than cricketers who came to those positions. It’s very unfortunate the way things have happened. “We are the pioneers who sustained the country’s cricket for it to obtain Test status. We did the spade work for today’s cricketers to benefit for what remuneration, nothing. We touredIndiafor Rs. 15 a day and we were given a blazer and a black trouser. We didn’t bother about money because nobody gave and nobody wanted it. Remuneration was never in our mind when we played. We wanted to play the game and we were happy to go and represent our country,” Fredrick said. “I am dead against having foreign coaches. They may be brought in short stints. What are they going to teach our national cricketers who have come through the mill from their junior playing days. Our coaches are very good. You have to train the boys in their formative years and teach them the correct technique in batting and bowling. You don’t need a bowling coach when they are playing for Sri Lanka. The Lankan coaches do a very good job and they should be handling our national team. Why should they go out and coach in countries like Nepaland Bangladesh. We are not colonial relics anymore,” Fredrick said. The Fredricks are Ranaviru parents having lost one of their two sons Harsha during the LTTE attack on the Mullaitivu Army camp in 1996. His other son Ushantha lives with his wife Bishani in the same neighbourhood.